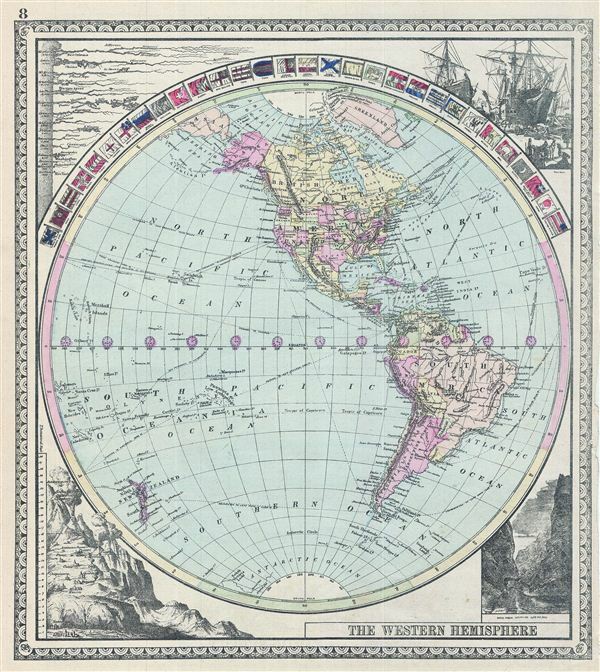 This is a beautiful example of the 1887 Tunison map of the Western Hemisphere. It covers from the Arctic Ocean and Greenland south as far as the Antarctica. The map is surrounded by flags of various countries, including the United States, Japan, egypt, Turkey, Russia, Tunis, New Zealand, among others. The lefts top and bottom quadrants depict the lengths of rivers and the altitudes of important cities respectively. The top right quadrant features a beautiful illustration of a Wharf Scene while the lower right quadrant features an illustration of the Royal Gorge in Colorado. Various important sea routes are noted. The map is color coded according to country and regional boundaries, however, the United States is color coded according to state boundaries. Various towns, cities, rivers and other topographical details are noted. Published as plate no. 8 in Tunison's Peerless Universal Atlas. Very good. Map of St. Paul's Mission Journeys and illustration depicting Variations of the Earth's Surface on verso. Verso repair along right margin.